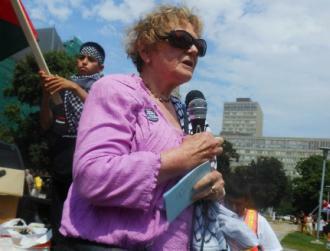 Suzanne Weiss is a Holocaust survivor based in Toronto, Canada, and a member of the Coalition Against Israeli Apartheid and Not In Our Name: Jewish Voices Opposing Zionism. Here, she comments on the stand taken by anti-Zionist Jews against Israel’s massacres in Gaza–and on the real history of the Nazi Holocaust and the resistance to it. We believe that “never again,” the often-repeated lesson of Hitler’s Holocaust, “must mean never again for anyone!”–especially the Palestinians. We also protest the full-page advertisement published in the New York Times and elsewhere by Zionist Elie Wiesel that holds Palestinians responsible for the deaths of the hundreds of Palestinian children in Gaza killed by Israeli bombs. “Nothing can justify bombing UN shelters, homes, hospitals and universities,” we say. Wiesel, a Nobel laureate and Holocaust survivor, accuses the Palestinian resistance group Hamas for having supposedly embraced a “death cult” of “child sacrifice” because Hamas has launched rockets against Israel. Sourani calls Israel’s actions the “Gaza Doctrine”–a “policy of collective punishment” in which “disproportionate force is used to cause terror among the civilian population to exert political pressure” on their government. “To bomb densely packed Gaza homes is a war crime,” he says. In 1942, the French police began rounding up Jewish residents by the tens of thousands–men, women and children–handing them over to the Nazis to be killed at Auschwitz, the death camp in Poland. Among the victims was my mother, who died in Auschwitz in 1943. The Nazis’ goal was to round up, deport and kill all the Jews in France–as was being done throughout Europe. But amid this terrible slaughter, a wave of revulsion grew in France against the attack on the Jews. Through the efforts of both social organizations and individual initiatives, thousands of Jews were hidden. Altogether, three-quarters of the French Jews escaped the Holocaust. The first big raid of July 1942 caught Jewish organizations in France by surprise. It was only then that the Jewish population realized that their children had to be hidden. They embraced the slogan, “Save the children by dispersing them.” Searches were initiated for safe havens, false papers were made, and transport arranged in an atmosphere of urgency and despair. More than 10,000 Jewish children were taken from their families and hidden. I was among them. In 1943, when I was 2 years old, a resistance organization took charge of my care and placed me with a peasant family in Auvergne, a farming region in south-central France. The children were saved, in most cases, by the actions not of individual heroes but of entire communities, who hid them not in cellars but in plain view. They were saved by a resistance that embraced not only the guerrilla combatants, but those who set up civilian networks to defy anti-Jewish decrees, and, in a different way, by those who looked the other way, who did not ask questions, and who–even if hostile to the presence of Jews–did not betray them. Today, the peoples of the world are unequivocally vocal in their denunciation of Israeli apartheid and Israeli slaughter. They express this in repeated gigantic demonstrations with signs and banners calling out: end to the killing in Gaza, lift the siege of Gaza, freedom for Palestine. Several governments–Bolivia, Brazil, Chile, Cuba, El Salvador, Nicaragua, Peru and Venezuela – have taken actions against the Israeli assault, including boycott and sanctions. Free Gaza! Palestine shall be free! Esse post foi publicado em cidadânia, educação, justiça, justice, opinião e marcado Holocausto de Gaza, não em meu nome, Sobrevivente do Holocausto Judeo, Suzanne Weiss. Guardar link permanente. Suzanne Weiss is a Holocaust survivor based in Toronto, Canada, and a member of the Coalition Against Israeli Apartheid and Not In Our Name: Jewish Voices Opposing Zionism. 1.